It's been a whirlwind weekend--a shiva call, visiting with my grandparents, meeting an old friend, Target (we were WAY overdue for a visit--oh Target, how I missed thee.....), and the new Harry Potter movie. This movie is SAD. As in, I was weeping hysterically. S looked over at me at one point and saw tears streaming down my cheeks. Took me the rest of the night to recover! It had a lot of interesting overtones to World War II, and I left thinking about my grandparents and wondering, yet again, how they survived what they went through. I look forward to the next installment being a big happier, though. On to scrappy matters--Sketchy Thursdays has a new sketch up, and you have until this Wednesday to play! Let me know if you do and I'll look out for your layout! As you can see, I went with a two pager this time! Ella's new ebook has been inspiring me! Excuse the awful photo though--what is it with two pagers and yucky photos? If anyone has any tips for getting a good two pager photo, please share! And, I get to pick a lucky Ella winner! It's DEBORAH! 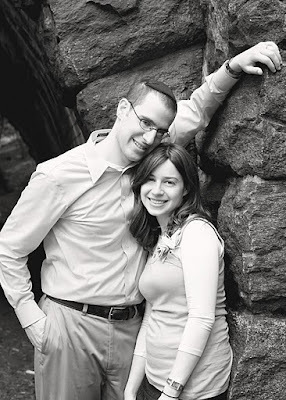 Deborah, please email me at keshet.shenkar@gmail.com and I'll get you your book code! Otherwise, I'm looking forward to spending the day sorting out my life. Between all the traveling and some sad feeling about the baby topic yesterday, I am sitting in a sea of post-its and a to do list to kingdom come. Wish me luck! When going through infertility, it can get easy to focus on what you don't have. On this one, beautiful thing that you know what change and enrich your life, but is out of your reach. For now. So instead, I try to focus on the tens of thousands of blessings I do have. And say thank you--for the friends who always make me laugh and lift me up when I'm upset, the warm bed waiting for me at the end of a long day (which is from Ikea and breaks every other day, but who's counting:) ha! ), my calm and happy scrapbook room. For the family that raised me since I was little (and I was not that easy to deal with, from what I gather) to the new family that's welcomed me in since I got married. For my grandparents living nearby, so I get to see them all the time. For all my friends who have welcomed little ones this past week, healthy babies who I know will grow into special people. For the man who has made me the happiest woman of all. And for G-d, from whom all blessings flow. And before I go, in case you've been eyeing some of those Ella e-books, Ella is having a huge Thanksgiving sale today! See details on the Ella blog! Also, don't forget to enter the GIVEAWAY in the post below (I'll choose a winner Sunday)! What are YOU thankful for today? Alternatively, what deals are YOU snapping up? It's been a few days, I know. Where did Scrappy Sunday go off to, you may ask? Well, I came home from a family wedding last night so totally pooped that I only had the energy to watch Jane Austen movies on the couch. Which we all know is a sad state of affairs. But today, I want to talk about something that is near and dear to my heart. Okay, lie. I want to talk about something that scares the Dickens out of me: two page layouts. I actually love this one--the contrast is key. It's just a really special layout to me. Ignore the stinky picture, but since this layout involves pink, brackets, handmade flowers, candy accents, and a donut, I like it. And an even yuckier picture--sorry about that! This one is my wedding shower. 2. So much space. What to do with it? 3. You have to line up the photos so they look nice, and this isn't always easy. 4. Did I mention they scare me? Ella has done it again--a new book all about double pagers, in conjuction with the Write.Click.Scrapbook team (before my time, though!). Which is basically like saying it was written by brother and sister. Or something like that. Annnnnnnnnddd......I get to give a FREE COPY to one lucky reader! To enter please leave a comment below telling me how YOU feel about double pagers! I've been meaning to post these shots for AGES, but life just got in the way. Darn life. Always wanting to me to do things, go to work, cook dinner, meet deadlines, etc. etc. But I digress. I was a bit nervous before the shoot, but aside from the 7 bajillion dogs we encountered (I'm terrified of dogs, and leashes seem to have gone out of style) we had a great time! 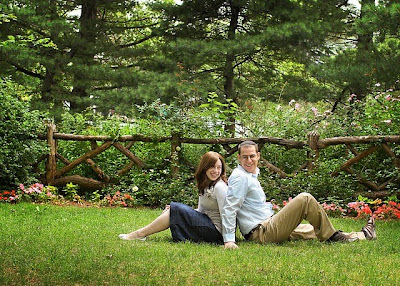 We met in Central Park, and Alexis really knew her way around there--which is good, because it's a labyrinth to me! This is just waiting to be enlarged on a layout. Can't WAIT to use it, with all of that delicious white space! How gorgeous is this scenery? Do YOU get professional photos done ever? 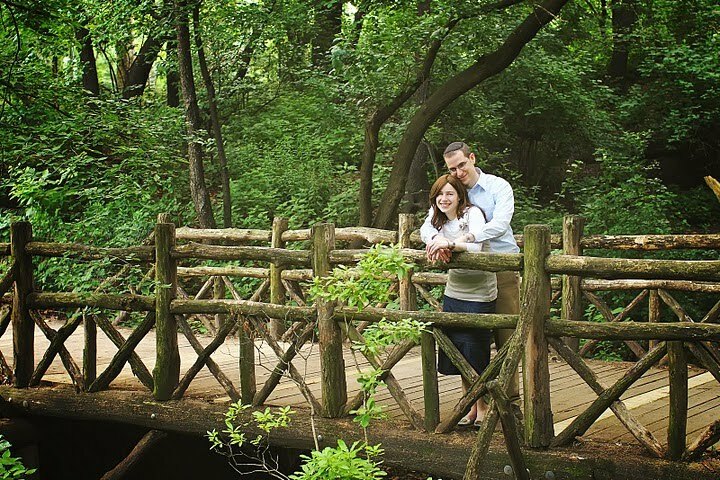 What is your usual plan for family pictures? Wishing you all a splendiforous weekend! And if you're looking for some scrappy inspiration this weekend, check out this week's Sketchy Thursdays sketch and play along! Now I don't like housekeeping--in real life OR internet life. But it must be done. So, in lieu of dusting and mopping, here's some WINNERS for ya! Please contact me at keshet.shenkar@gmail.com and I'll get you sorted out! PS--If you're wondering where this blog has been, fear no more--a new post should be coming tomorrow. Life has just been hectic! 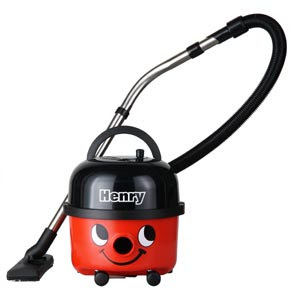 PPS--How awesome is that vacuum cleaner? Minestrone soup is waiting to be made, so off I go--talk to you soon friends! Well, I'm back from a whirlwind mini-vacay in NYC. We stayed here and enjoyed a massage/swim here--and it was H.E.A.V.E.N.L.Y. Really. But now I'm back to real life and ready to talk more about DTs and publications! Although DT calls tend to come in droves, there really is always another train on its way! Most teams have terms of 6 months to a year, so before you know it, the same team you're dying to be on will be having another call. There was a period in May where I applied to maybe 8 design teams, all of whom were companies I loved. I didn't get any, and I was so upset, thinking I had missed my big chance. But within a few months, there was a new drove of calls out, to companies I also loved dearly. So don't get down--keep trying and remember the right opportunity might be just around the corner. Now this is something I almost didn't write about, since it discusses a part of my personality I'd rather do without. I get jealous. And when it comes to DTs, I got really, really jealous, especially when I felt like other people were "always" succeeding while I was "always" failing. While I wish that emotion wasn't so automatic for me sometimes, the real test is what you do with it. So what I do is I reach out. If I'm jealous of someone, I make an enormous effort to comment on their work, encourage them, and share their joy when they do succeed. And while it may not feel totally sincere at first, within a short time I feel invested in them. And then I truly do rejoice in their successes. Jealousy can be a divisive force in the pub/DT world, but if we redirect and re-channel that emotion, we can turn jealousies into friendships. This is the most obvious piece of advice--but also the hardest, for me. Be yourself. There already is an "Ali Edwards" (for example), so there's no point in being a stunt double for her! But there isn't another person with your artistic skills + photos + family + perspective on life + people skills. You're a unique package, and try to market your attributes, not change them. 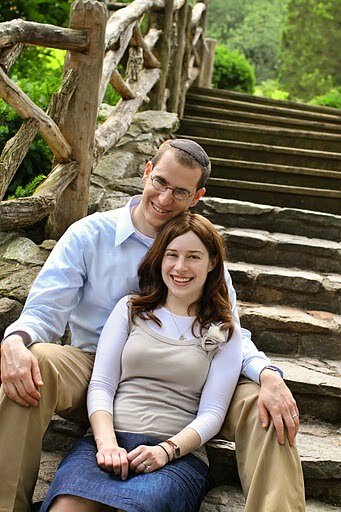 For example, I used to think I wasn't succeeding at DTs because I didn't have any cute kids to photograph. And while I'm still working very hard on conceiving a few photo subjects (aka children), in the meantime I scrap about me--my life as a woman without children, a woman trying to have children, a woman figuring out who she is. It's the story I have to tell right now, so I just tell it. 7. But it's Still not Working! That's all I have for now. I have really enjoyed reading all of your perspectives on this, so keep it coming! Any final advice that YOU have? Today, me and my BFFs over at Ella Publishing are having a little blog hop celebrating--what else?--friendship. I have been blessed to make many good friends over the years. Some so very kind that they spent this past week filling out forms and notarizing them to witness to the general stability of my character. They have pulled through bad times (horrible breakup right before a trip to Disneyland in late 2007, anyone?) and been with me in good times. They have made me snort apple juice up my nose and laugh so hard my chest was actually in pain. They are truly, truly the best. 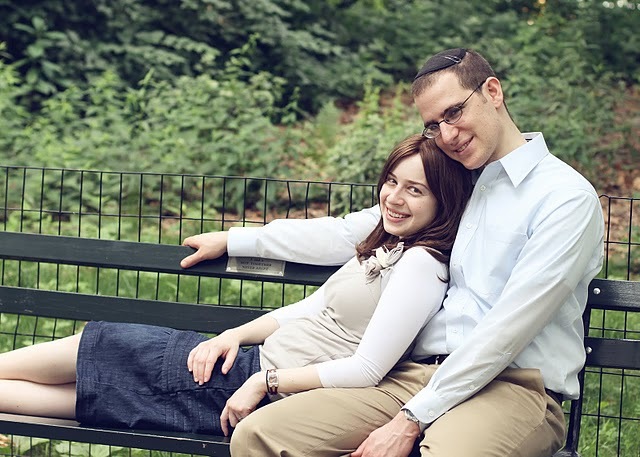 And I believe my marriage has been much better and stronger because of all the love, care, compromise, and problem-solving I got to do with my friends first. 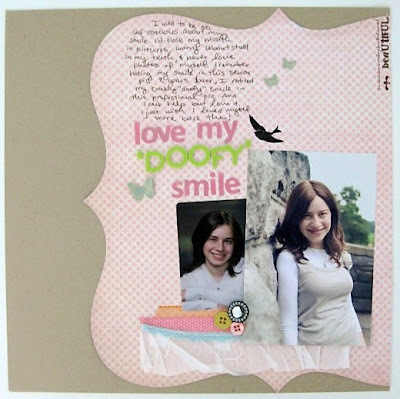 Joining the scrapbooking world has led me to even more friends, also wonderful and giving and kind people. 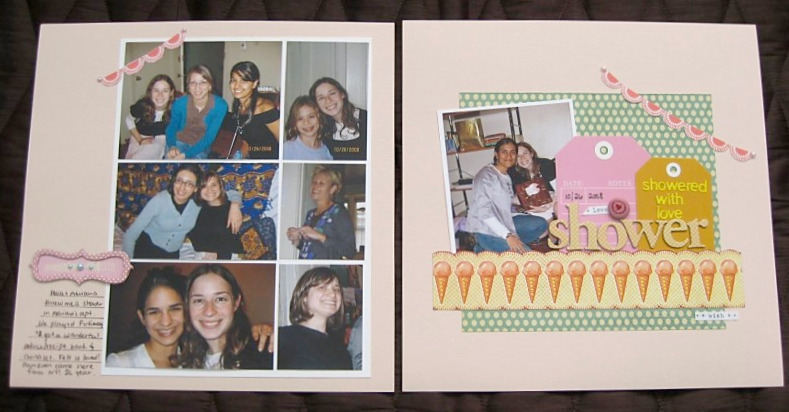 I'm fortunate to work with them on the Ella team, as we explore scrapbooking--and our lives--from new angle. When I think about what I've gained from the scrapbooking community, I can't help but think of these friends. Their talent, their heart,and their wisdom are reflected in the projects they create. I feel very honored to be counted among this wonderful group of women, and I appreciate all of you! 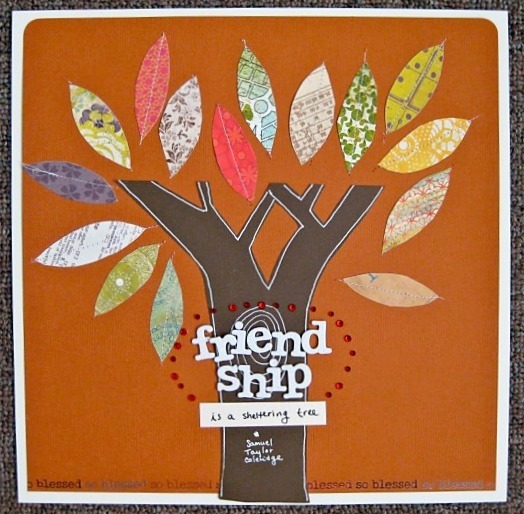 In case you can't read the little tag, it says "friendship is a sheltering tree--Samuel Taylor Coleridge." A googling of "friendship + tree" led to some misses, but eventually to this quote, which I love. 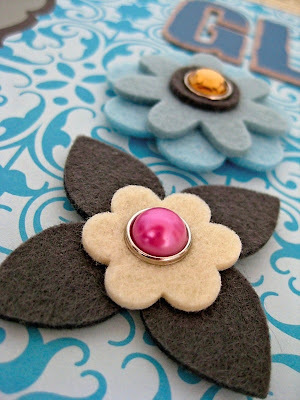 And for a little token of my friendship, I am GIVING AWAY a box of scrappy goodies to one lucky commenter below! Thanks for stopping by and have a spectac-ELLA weekend! And because my main reason for blogging is to hear what YOU have to say (I talk to myself often enough, believe me) how was friendship changed YOUR life? 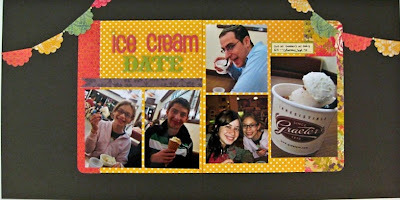 Yours truly is hosting over at the Ella Publishing blog today with a post on scrapbooking about things OTHER than children! My Ella buds Diana and Francine contributed, so that's reason enough to pop over there! 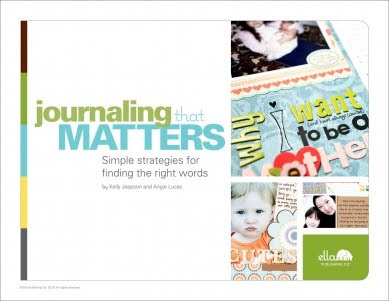 I also have another copy of Ella's new book, Journaling that Matters, to give away! To enter, leave a comment below! I will choose a winner on Wednesday. --Stephanie Baxter, please email me so I can get you your ebook! Otherwise, I'll choose a new winner Monday. --Thanks for all of your insightful comment about the Pubs/DT post. I am aiming to have Part II posted on Sunday, so come back for that! Today I want to write about something that is near or dear to my heart. It has brought me ulcers, stomachaches, frustration, joy, pride, disbelief, jealousy, anger, and more. It's the DT/publication process. A bit of background about me: I have scrapped for almost 10 years, but I didn't find the online scrapping community until a bit over a year ago. Having been a scrapbooking junkie for some time, once I found out there was a way to get scrapbook supplies for free, I was sold! As I got to know more people on message boards, I also wanted to join teams where I could get to know these great people who shared my crazy hobby a bit better. So I began trying--submitting nearly every layout I made for publication, applying to so many design teams I've completely lost count, stalking the Two Peas Pub board for tips and encouragement. And for a long time, I didn't really get anything--I had some guest design gigs and features here and there, but nothing that seemed proportionate to what I was putting in. I was frustrated. And upset. And jealous at the same names that seemed to pop up everywhere. And then one day, I realized I couldn't go on that way, so I emotionally pulled back a bit from the process. I took submitting breaks. I only applied for teams that REALLY seemed like a good fit. Then, a few months later, I got some good news. While my new teams were announced in piecemeal on my blog, I found out about all four within a two week period. It was surreal, and still is. 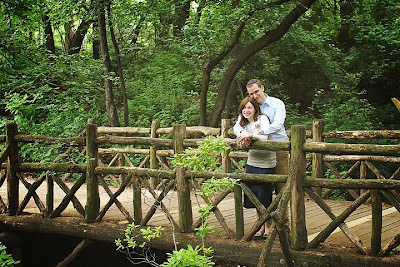 So while I don't feel that qualified to be writing this post, I love encouraging people. So here are my tips for publication/DT success, while maintaining your sanity and general good nature. I see myself as having two "hats" with scrapbooking--the "artist" hat that focuses on creating the most true-t0-myself project, and the "marketer" hat that worries about presenting said project in the best light. The marketer hat looks for a great photo--bright, cropped closely, and clear (believe me, I learned this the hard way--it took a comment from a magazine editor and lots of Studio Calico ladies' suggestion to change the way I photographed my layouts, but it was WELL worth it). 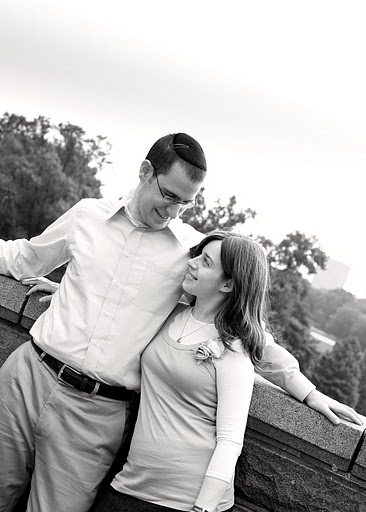 Once you have a great photo, get it out there, on your blog, message board galleries, etc. People can't find you if your work isn't out there! 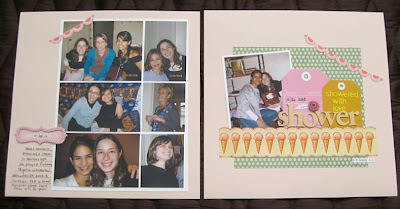 Breaking into the scrapbook industry is like moving to a new neighborhood--you have to hit up block parties and community gatherings to meet people! Online communities, from message boards to blogs, are often very welcoming of new faces, and these relationships can lead to connections later on (not that you should be friendly just to get something out of people, but that genuine friendships can then lead to idea-sharing and opportunity in general). Rejections hurt, period. 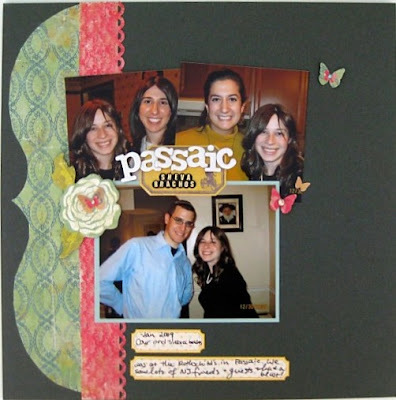 And this is even moreso in scrapbooking, when the product being rejected is something you created with your own hands, with pictures of your family. It can really sting. But the truth is that most companies have more talent than they have space for--too many talented potential team members, too many amazing pages. So, the fact that you didn't get chosen doesn't mean you weren't good enough! It may mean the company is looking for someone with more of an online presence, or to provide personal diversity, or because their customers have expressed interest in a certain style. Again: it doesn't mean you aren't good enough. In the meantime, I'd love to hear YOUR point of view on this topic! Congrats Stephanie! Email me at keshet.shenkar@gmail.com and I'll get you sorted out! 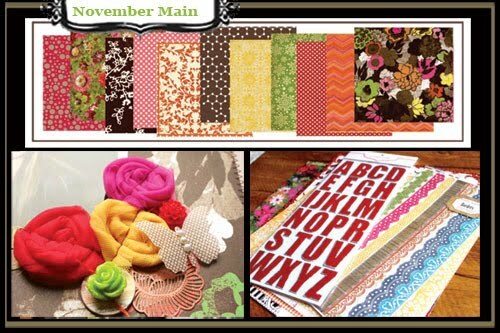 The November kit is up at Scarlet Lime and it's a beauty! 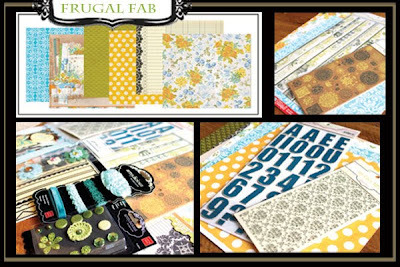 The main and Frugal Fab kits are still available, so head on over and snap them up! I love the fall colors in this! I went simple on this layout below, about my little bro. Journaling reads: I don't remember what year this was or how old you were. I just love the glimpse into you as a boy. 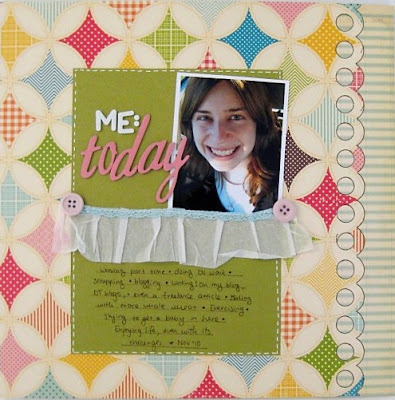 This is an example of a layout you can create when the event has already been lost in your memory. Journaling reads: After Sarah and Brian got engaged, the fab 4 plus husbands went up to Monsey for the vort. We had a blast! I just crumpled patterned paper by hand for this. Easy-peasy! 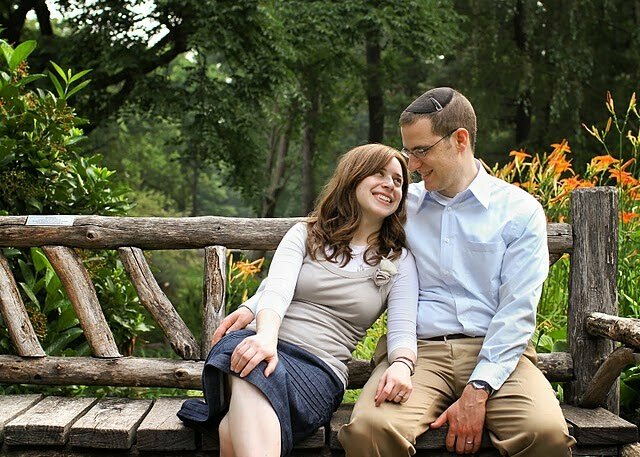 This first layout needs a little backstory--S and I met online at a Jewish dating site, and this photo below (minus his mom) was his profile picture! I'd been wanting to scrap this for some time, and loved the color combo between S's shirt and the kit. I used some beloved punches on this one--the Martha Stewart butterfly, and bracket border! This last one is a photo from my days as a camp counselor. Late nights, screaming children, poor hygiene management (on the part of the screaming children)---I wonder how I survived it all! But this photo reminds me of the awesome parts of camp, that made the squishy broccoli quiche and sleep deprivation worth it. The lazy mornings lying on the grass, hours spent cooking hot dogs to perfection, sweet little faces asking you when the next activity starts...priceless. And there you have it--happy November! What are YOU doing special for November? And before you go, check out THIS beautiful post and THIS fun sketch! Over a month ago, I got a CRAZY email. It was from Elizabeth Dillow, and it was asking me if I had received their email inviting me to join Write Click Scrapbook, and if I could please let them know if I was interested. What on earth? First, I nearly fell off my chair. Then, I freaked out about the missing email and worried it was too late to respond. But mostly, I was shocked that such a cool group of women, whose profiles I had read all in one sitting when I first found WCS online, would ask me to join them. To say I'm honored would be an understatement. If you haven't checked out the site yet, it's a wonderful spot of scrappy inspiration. Journaling reads: I used to be so self-conscious about my smile. I'd close my mouth in pictures, worried I had stuff in my teeth, and never loved photos of myself. I remember hating my smile in this senior pic. 8 years later, I noticed the same crinkly "doofy" smile in this professional pic. And I can't help but love it. I just wish I had loved myself more back then! 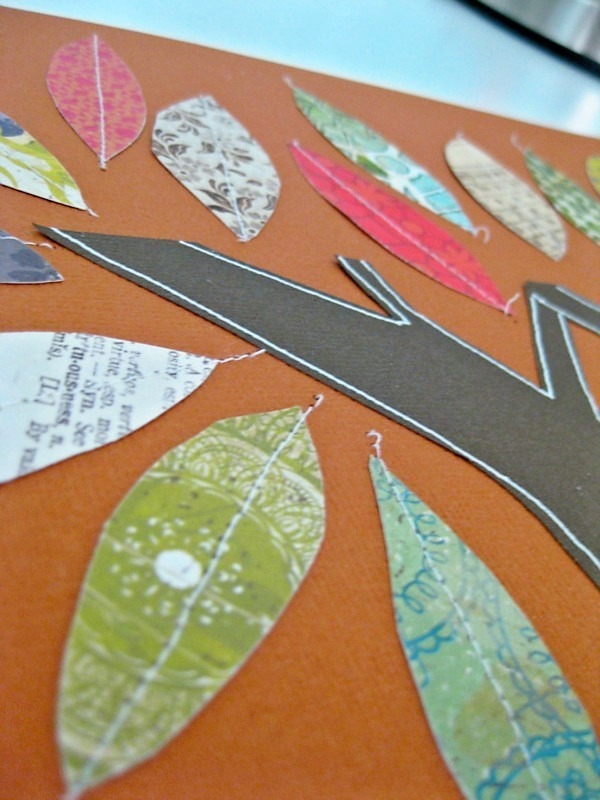 Supplies used: Studio Calico October kit and add-ons, Photo credit: Alexis Hardy Photography. And before I go, I realized I hadn't shared my Sketchy Thursdays layout last week! This one is about our sheva brachos (use the link to get an explanation!) at a friend's house in Passaic. I'm working on a post about my journey so far with publications and design teams, and I would love YOUR input. 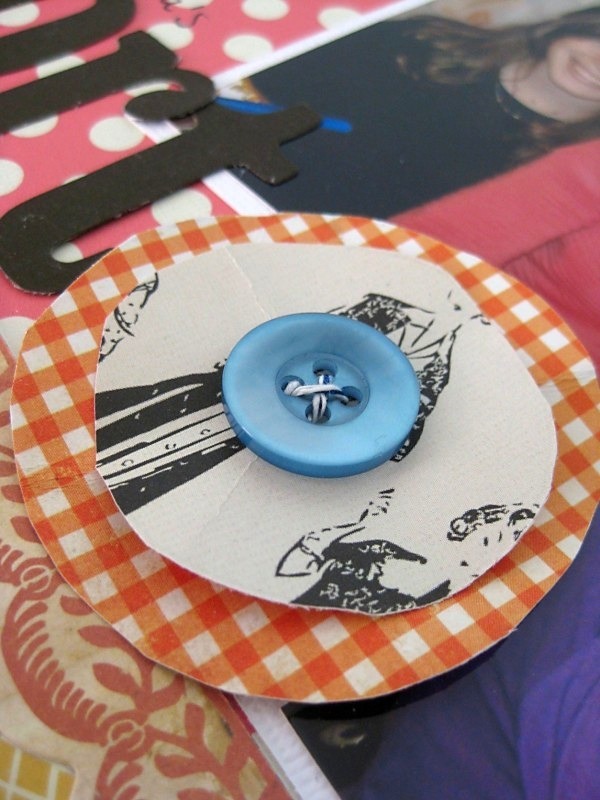 What's your #1 piece of advice for someone wanting to break into the scrapbooking industry? PS--Ella giveaway still open in the post below! PPS--You can access this site through keshetstarr.com now!